I have a little game for you. Figure out who the twenty video game characters are. eh....I can name MOST of those, but there are some I just have no clue. That and, well, I don't know some of their NAMES, but I know what game they came from. That good enough? try your best just put you answer in a spoiler tag so not to ruin other's fun. I'm glad this was fun for you guys. 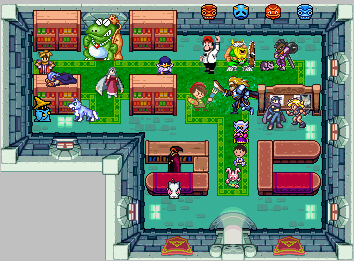 And the room they are in is the library from LOZ minish cap. 12. Johnny He's the man! Wow, that's a lot. And I'm only picking up like 20-30, fail. Besides Mine are more like a scene.